Not counting underclassmen who are in the process of the various academy programs, last year’s senior class of 184 students (class of 2018) boasted 80 Academy students (42% of the class). Students will also complete courses of study for each specific area of focus. All service work must be approved by the department mentor. Each final project will be supported by in-depth research to be presented to a committee. Students wishing to receive Academy of Fine Arts designation on their transcripts must obtain faculty signatures for all of the above requirements by the end of the Fall semester of their Senior year. The AP Capstone™ is an innovative new College Board Diploma program, designed in collaboration with leading colleges and universities, that equips students with the independent research, collaborative teamwork, and communication skills they will need to succeed in higher education. 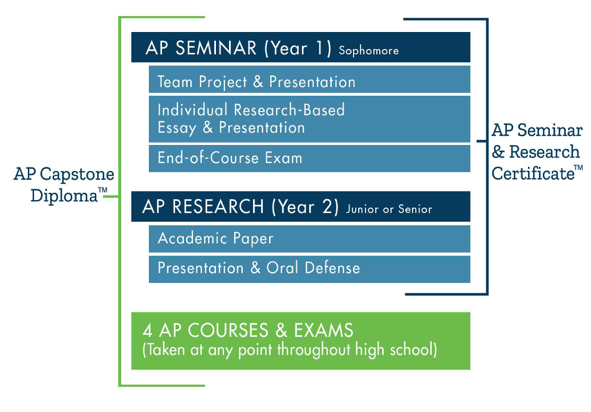 AP Capstone™ is built on the foundations of two AP® courses – AP® Seminar and AP® Research – and is designed to complement and enhance in-depth, discipline-specific work in four (4) other AP® courses. In AP® Seminar, students investigate both scholarly and contemporary issues from multiple perspectives, gathering and analyzing information from various sources in order to develop credible and valid evidence-based arguments. In AP® Research, students cultivate the skills and discipline necessary to conduct independent research in order to produce and defend a scholarly academic thesis. This illustration provides an overview of the program structure, including thorough course performance assessments and written exams. • Students who earn scores of 3 or higher in AP® Seminar and AP® Research and on four (4) additional AP® Exams of their choosing will receive the AP Capstone Diploma™. • Students who earn scores of 3 or higher in AP® Seminar and AP® Research but not on four additional AP® Exams will receive the AP® Seminar and Research Certificate™. Juan Diego students (including Freshmen) qualify to enroll in AP® courses based on their College Board Accuplacer Diagnostic® scores in Reading Comprehension and Sentence Skills and an advanced Lexile (reading level) score. Juan Diego administers the Accuplacer Diagnostic® exams & Lexile exam to all incoming students as their Educational Assessment Exam. Students take these exams each succeeding year. Students pursuing the Capstone course track typically take AP® Art History their freshman year. Sophomore year they take AP® World History and AP® Seminar, two separate courses joined by a theme of in-depth writing, research, and oral presentations. Sophomores frequently take additional AP® Courses, such as Biology, Environmental Science, or Psychology. In their Junior year, students continue to hone their analytical reading, writing, and presentation skills in Capstone Theology, while pursuing additional AP® courses. Students round out their Capstone experience with an independent research project culminating in a research paper and an oral defense. Extracurricular Participation: Students will complete the equivalent of three years of active participation in Fine Arts extracurricular activities. These activities may include theatre productions, art shows, dance concerts, and musical performances. Service: As a part of their required JDCHS service hours, the student will perform service related to the arts including but not limited to tutoring, solo performance, and volunteer work within the community. All service work must be approved by the department mentor. 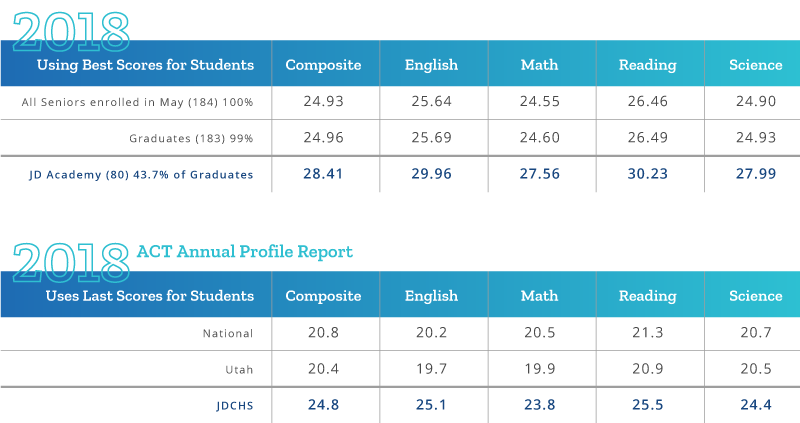 The Juan Diego Catholic High School Academy of Sciences is a specialized program of coursework within the JDCHS curriculum focused on developing students’ skills in the areas of Science, Technology, Engineering, and Math (STEM). Students who complete the Academy of Sciences requirements receive recognition at the Academic Awards Ceremony at the end of the year and receive an Academy of Sciences designation on their JDCHS transcript. The designation indicates to colleges that the student has done exemplary and extensive work in STEM fields during their time at JDCHS. Please be aware that requirements have changed from previous years. The updated requirements are below. Requirements: 3 AP STEM courses can be any combination of science, math, and technology. 2. Extracurricular Activities and Service. Requirements: Students must complete a rigorous independent research project approved by the science department. Requirements: Students must participate in a recognized science competition such as Intel Science and Engineering fairs or the Junior Science and Humanities Symposia.